Our teams working on LivePlan, Bplans.com, and TeamOutpost.com have made it their mission to help entrepreneurs and business owners succeed. We provide software solutions to organizations looking to provide best of breed Lean Business Planning and financial management to their clients and customers. Resellers, intrapreneurs, employees, franchisors, and more use our software to plan and manage their business or department, set meaningful goals, and track financials against forecasts. You can see some great examples of work we&apos;ve done, but every partnership is unique, so please contact us to discuss what might work for your needs. Top brands looking to reach the same customer demographic can benefit from partnering with us. We believe that when our missions and messages align, we amplify our value and usefulness to small- and medium-sized businesses. For example, the highly-selective non-profit program, Goldman Sachs 10,000 Small Businesses, has adopted LivePlan as a powerful tool for strategic planning and financial forecasting. Their mission is to help entrepreneurs create jobs and economic opportunity by providing access to education, capital, and business support services. 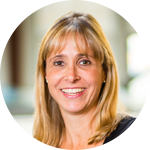 Sabrina Parsons, CEO of Palo Alto Software, Inc. Sometimes in larger corporations, employees, agents, or franchisors take on a more entrepreneurial role in operations and business growth. Our software, training resources, and research-backed best practices help those companies streamline their workflow and set individualized growth goals for in-house and remote agents so they can grow faster. For example, American Family Insurance agents tap the power of LivePlan on an enterprise-level scale. They create strategic forecasts with automated, visual representations of key performance indicators through our dashboard features. They are able to more easily predict and track performance and financials in real time, so they can make more accurate and informed strategic decisions as their figures change. There are many other companies providing software, apps, and resources to help businesses succeed. In some cases, working together can help improve our products or amplify the effects or our collective efforts. For example, LivePlan can sync with QuickBooks Online data in real-time, giving businesses instant access to data on their key business metrics. 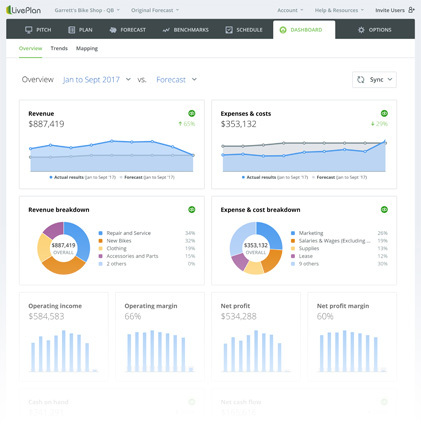 LivePlan helps businesses leverage their accounting data into an easy-to-understand dashboard so they can make solid strategic decisions with the help of smart budgets, forecasts, and visual financial reports, without spending more time on data entry or sifting through spreadsheets.